Two aviators are in good condition following the crash of their F/A-18F Super Hornet in the Philippine Sea, U.S. 7th Fleet announced on Monday. 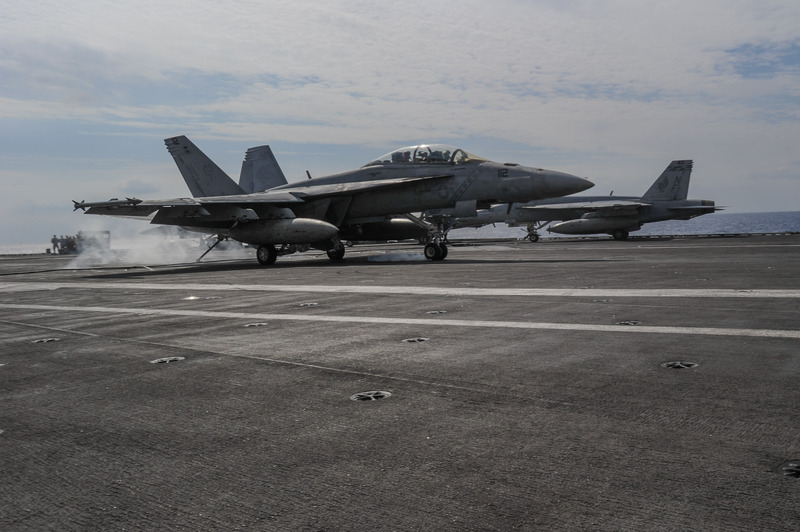 The Super Hornet that was part of Carrier Air Wing 5 aboard carrier USS Ronald Reagan (CVN-76) had “experienced a mechanical issue that resulted in the crew ejecting while conducting routine operations,” at about 11:30 A.M. local time, U.S. 7th Fleet told USNI News. Reagan and Carrier Air Wing 5 have resumed normal operation and the crash is under investigation, the service said. The Super Hornet was assigned to the “Dambusters” of Strike Fighter Squadron (VFA) 195 from Marine Corps Air Station Iwakuni, Japan. The Reagan Carrier Strike Group recently concluded the Keen Sword 19 bilateral exercise with Japanese and Canadian warships off the coast of Japan. The Japan-based strike group has been underway since Aug. 14, 2018. The Super Hornet crash follows an Oct. 19 crash of an MH-60R Seahawk assigned to CVW-5 that resulted in the injury of a dozen sailors. “All patients from the Oct. 19 helicopter crash have been released from the hospital in the Philippines and are currently receiving any necessary follow-on care from Navy medical providers,” Lt. Cmdr. Matt Knight told Stars and Stripes. The following is the complete Nov. 12, 2018 statement from U.S. 7th Fleet. PHILIPPINE SEA – A Carrier Air Wing (CVW) 5 F/A-18 experienced a mechanical issue that resulted in the crew ejecting while conducting routine operations in the Philippine Sea, Nov. 12. The crew was immediately and safely recovered by USS Ronald Reagan (CVN-76) search and rescue aircraft and brought back to the ship for evaluation by medical personnel. Both aviators are in good condition. CVW 5 is embarked onboard Ronald Reagan and is currently underway in the U.S. 7th Fleet area of operations in support of security and stability in the Indo-Pacific region.